Boatwright, Rakocevic shine as USC dismantles crosstown rival UCLA 80-67. LOS ANGELES - In a battle between two struggling teams in desperate need of wins, USC defeated the visiting UCLA Bruins 80-67. Backed with the strong home crowd, the Trojans came out firing early, jumping out to a 12-4 lead just four minutes into the half. However, as the first half progressed, the Bruins fought back into the game. A Cody Riley And-1 layup brought them within 12-18 and also caused Nick Rakocevic to pick up his second foul. Rakocevic played sparingly for the rest of the half. In his place, freshman J’Raan Brooks gave the Trojans a lift off the bench. In eight minutes of action, Brooks poured in 5 points and 3 rebounds. At the half, the Trojans held onto a 36-33 lead. And with UCLA having 26 of its 33 points in the paint, it was clear that the Trojans were going to need Rakocevic to stay out of foul trouble and to protect the paint in the second half. Andy Enfield’s squad came out with great energy after the break, and went on a 24-9 run in the first ten minutes. The game-changing run was propelled by Bennie Boatwright, whose stellar shooting exploited the Bruins’ zone defense, and Nick Rakocevic who dominated UCLA’s big men on the boards and in the paint. Boatwright finished with 21 points and 5 three-pointers while Rakocevic ended the game with a double-double of 21 points and 12 rebounds. Boatwright, who missed all of the pre-season and a few regular season games recovering from off-season surgery, says he feels like he is back to his normal self, and his teammates have noticed. In the 2nd half, the Trojans outscored the Bruins 44-34. They also forced 20 turnovers and although they had 16 turnovers of their own, USC had an impressive 26 assists to the Bruins’ 13. 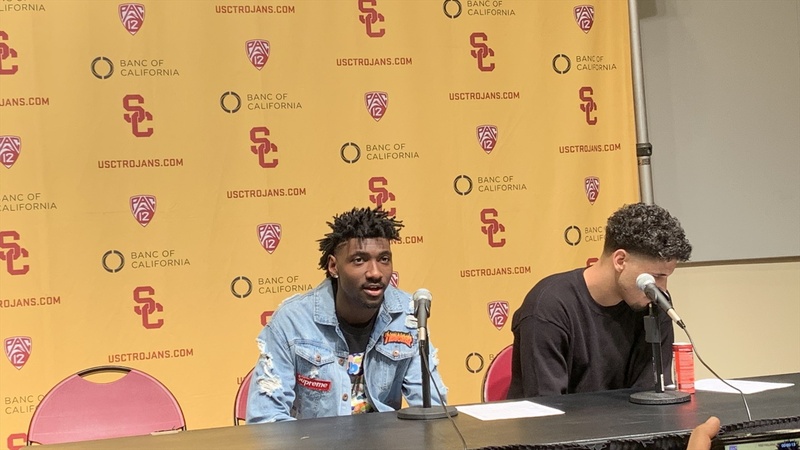 Enfield addressed how important the ball movement was to the Trojans’ success. Up next for USC on their homestand is a battle with the Arizona Wildcats on 1/24 at 6PM.